In this article, I will discuss (in details) about the Excel VBA Worksheet Events and their uses. This is a very thorough guide and I have tried to explain it in layman language. If you fail to understand any topics, put your confusions in the comment box. This article is part of my series: Excel VBA & Macros – A Step by Step Complete Guide and Learn Excel VBA Events Completely with 5 Tutorials. Worksheet related events are some of the most useful. Learning how to use these events can benefit you most as these events provide your applications do impossible things. The following table lists the most commonly used worksheet events with a brief description of each. Remember that if you are creating an event procedure for worksheet “Sheet1”, then the procedure must be entered into the code module for “Sheet1”. Click the “Sheet1” object in Project window to activate the code module for “Sheet1”. Activate and SelectionChange events procedures are entered into Sheet1 code module. Activate When the worksheet is activated, this event executes. BeforeDoubleClick When the worksheet is double-clicked, this event executes. BeforeRightClick When the worksheet is right-clicked, this event executes. Change When any cell on the worksheet is changed, this event executes. Deactivate Before the worksheet is deactivated, it executes. SelectionChange When the selection on the worksheet is changed, it executes. Change Event, SelectionChange Event, and BeforeRightClick worksheet events are provided in the working file. When a different value is generated from a formula used in a cell. When an object is added to the worksheet. Example of objects: a chart, a shape, etc. Relevant procedure for the Change event is “Worksheet_Change”. Worksheet_Change procedure has a Target argument. This argument is of Range (Range=Cell) object type. When you change something in a cell of a worksheet, that cell name is stored in the Target argument. 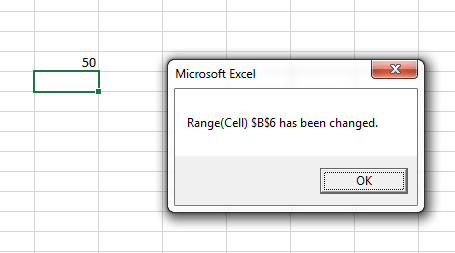 MsgBox "Range(cell) " & Target.Address & " has been changed." Change event for worksheet “Sheet1” is executed. If you change the formatting of a cell, it will not execute the Change event. But choosing Home ➪ Editing ➪ Clear ➪ Clear Formats will trigger the Change event. Pressing Delete will trigger the Change event, even the cell is empty when you press Delete. 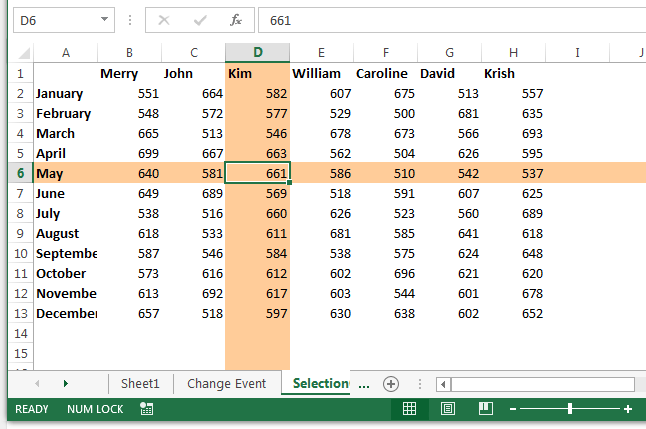 Worksheet cells changed using Excel commands may or may not execute the Change event. For example, working with sorting and goal-seeking operations in a worksheet cell will not execute the Change event. But if you work with operations such as Find and Replace, use the AutoSum button, or if you add a Totals row to a table, then Change event will be triggered. If a VBA procedure changes a worksheet cell, then the Change event is executed. The Change event executes when any cell on the worksheet changes. But maximum time you want that changes made to a specific cell or cell range will be counted. How do you do that? Finally click OK to close the dialog box. Cell Range A1:E10 is named InputRange. I am now going to write the Worksheet_Change event-handler procedure in such way that whenever a user changes something in the cell range InputRange(A1:E10), a message box will pop up with the information which cell has been changed. You see that the Worksheet_Change event-handler procedure has a Target argument. It is of Range object type. Target corresponds to a worksheet cell that has been changed by a user. It means that say you have made some changes in the cell F15, then the Target argument= F15. MsgBox "The changed cell is in the Input Range." ‘Cell A1:E10 is named as InputRange: It is just a comment. Dim VRange As Range: A new variable VRange is created. It is a Range type object. 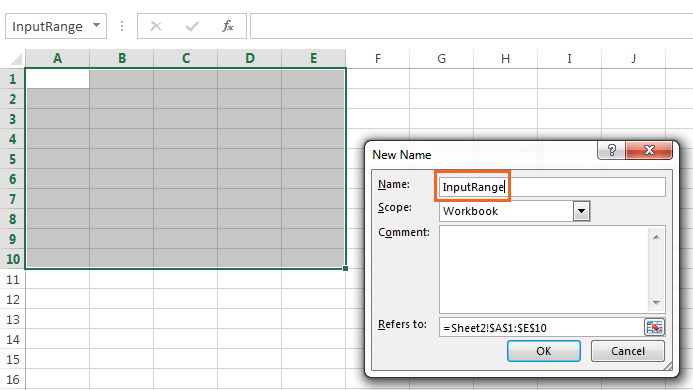 Range type object means that this variable(VRange) can store only worksheet cell/range reference. Set VRange = Range(“InputRange”): VRange variable now contains InputRange(A1: E10) reference. The above three line code explains that if Union(Target, VRange).Address = VRange.Address, then MsgBox will pop-up this statement: “The changed cell is in the Input Range”, otherwise if Union(Target, VRange).Address ≠ VRange.Address then nothing will happens. In the following quotation, I have explained Union function in VBA. Our preceding Worksheet_Change procedure has a bug: a user can make changes in more than one cell, so Target argument may contain a range. Therefore, the procedure requires to check all the cells in Target. So my procedure has to check each changed cell and if the cell is within the range, then a message box will be displayed with some information. The above code will generate three message boxes(one under another) shown in the following image when a user makes changes in the cell range C5: C8. Change Event is executed when some changes have been made in cell range C5: C7. Move the cell cursor. Active cell’s row and column will be shaded. Caution: This procedure’s first statement Cells.Interior.ColorIndex = xlNone clears all the background shading applied to the worksheet. But if the shading is the result of a style applied to a table, then the macro doesn’t erase the table’s background shading. 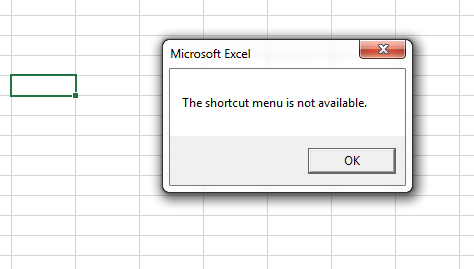 Just think that you don’t want to show a shortcut menu when you right click on a worksheet cell. In this case you can use this Worksheet event. The following procedure makes the Cancel argument to TRUE. This cancels the working of the RightClick event that would show a shortcut menu. Instead, a message box appears. MsgBox "The shortcut menu is not available." BeforeRightClick Event cancels the RightClick event if Cancel argument is made TRUE.